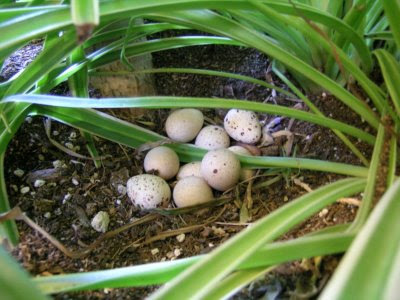 This was a nest of Gambel's Quail that we accidentally discovered last spring. She layed an egg or two a day, stockpiling them in her nest. The Mama would leave for the whole day, feeding alongside the 'Papa', and return to her nest at night while the 'Papa' stayed nearby to guard their nest. This nest was particularly remarkable for us. We happened to be at a nearby window when it was time for the eggs to hatch. It was incredible. Within ten minutes, every egg hatched and the little chicks dropped down to the ground, scaling down a dangling plant, and gathered around their Mama. One little chick after another popped out of the plants and toppled down. It didn't seem to matter that the eggs were layed in the nest on different days, they all were ready to be hatched at the same time. 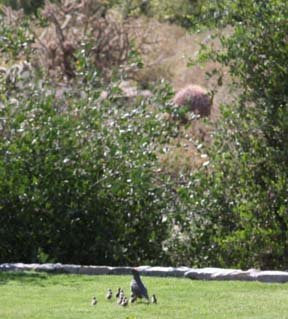 In no more than ten minutes, literally, the little babes were with their parents, striding off into the desert...the brutal desert with bobcats, coyotes, and snakes. Incredible. Our visiting family from out of town were there that morning to catch the whole thing on camera. It all happened so fast. My brother-in-law didn't have the lens he wanted for some sharp photos...I'm grateful he had the camera handy. We couldn't believe what we had witnessed!